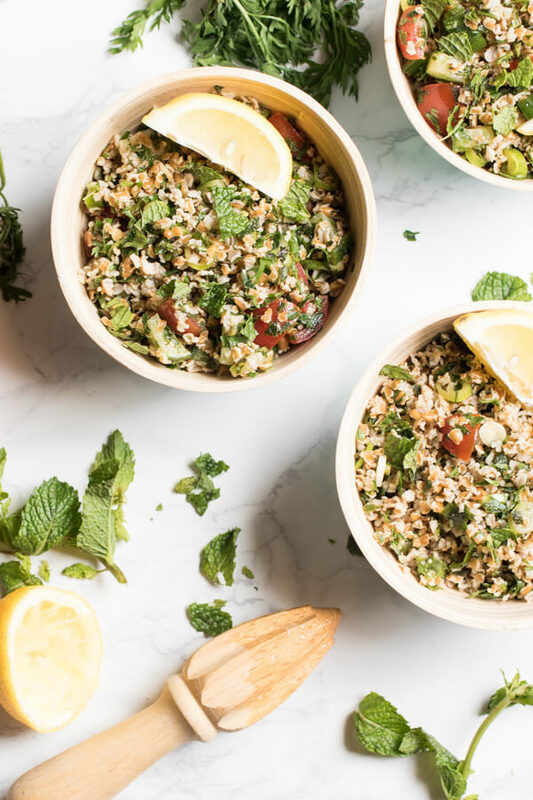 A light refreshing salad filled with fresh herbs, veggies, and heart healthy bulgur. 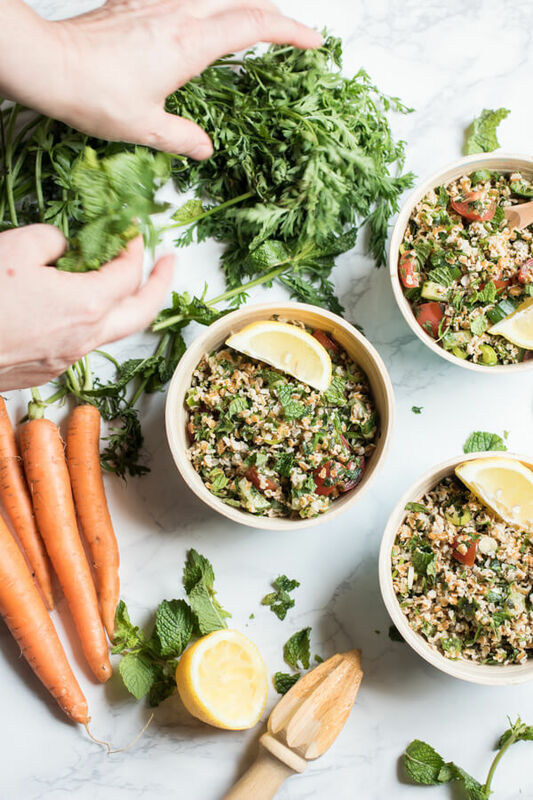 Carrot top tabouli is my favorite summer lunch. 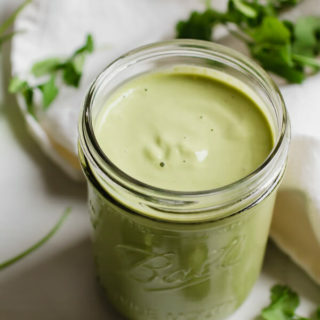 When it’s too hot to cook you need a recipe that doesn’t require turning on the stove or oven at all. 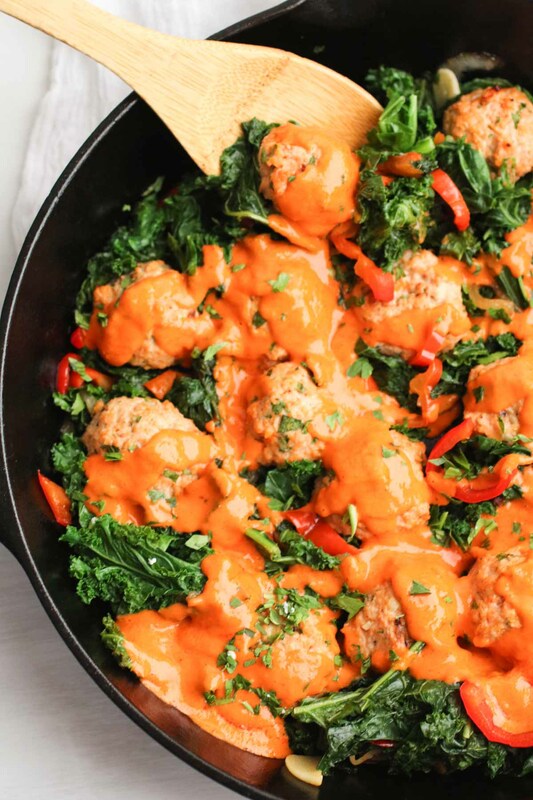 A recipe that leaves you feeling satisfied and happy. A summer salad that is more than just veggies. 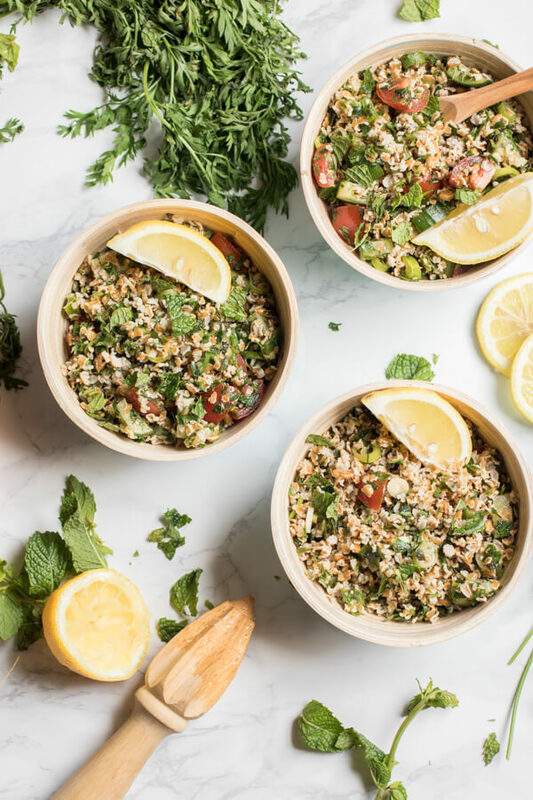 Tabouli salad (or more accurately spelled tabbouleh) has been my answer to the summer cooking woes for as long as I can remember. 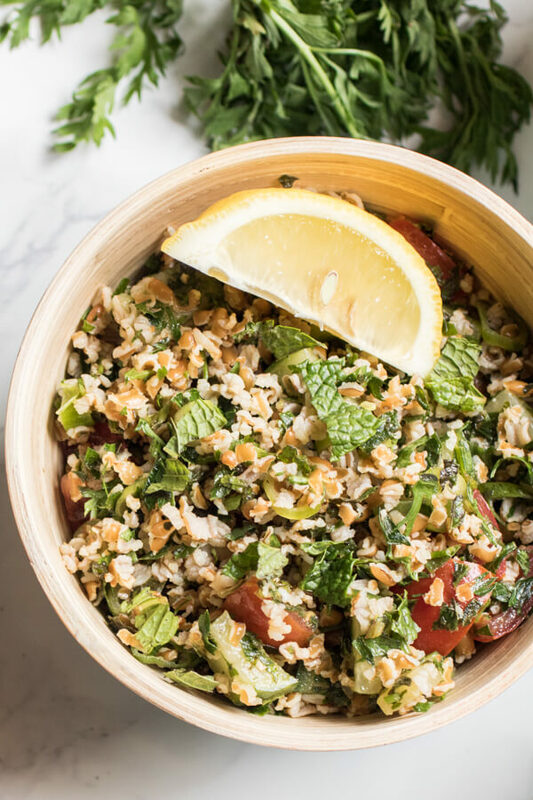 As odd as it may sound tabouli salad was one of my favorite meals growing up. When Mom announced it was tabouli night the kids in the Pappa household did a little dance and ran to the table. How my Hungarian Mom knew about tabouli in the early 80’s in Scranton, Pennsylvania is a mystery to me, but why we loved this dinner is no mystery at all. Mom would put out a big wooden bowl of the veggie filled, super lemony tabouli salad, and a platter of large romaine leaves. We would all serve ourselves, by overfilling several lettuce leaves with the refreshing salad and noshing like little monsters. 4 little Hungarian-Italian hippie monsters 😉 We always went back for seconds and thirds. There was rarely any leftover. 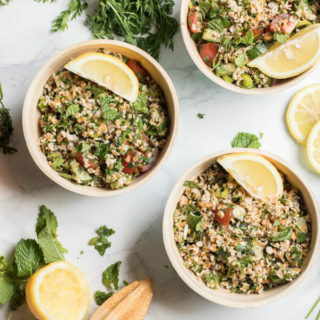 It’s a sweet memory actually, and one of the main reasons I still love to make a big batch of tabouli during the hot summer months and eat it all week. I do have leftovers in my house as I’m not feeding a family of 6. The traditional recipe is quite simple, bulgur wheat doesn’t require cooking, simply cover with boiling water and allow it to sit for 30-60 minutes. 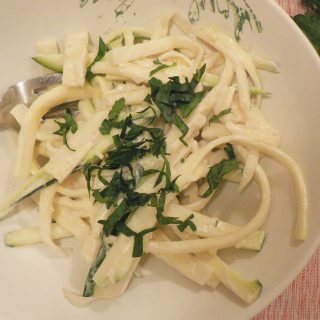 Then toss together with tons of parsley and mint and in this case, I threw in a bunch of carrot tops. 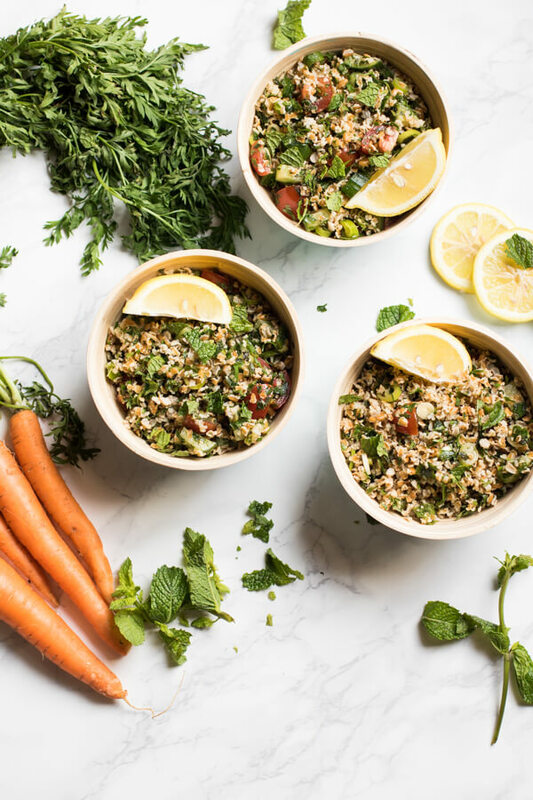 My fridge was overflowing with carrot tops and I hate throwing them away so I thought tabouli was the perfect vehicle for their earthy sweet green goodness. Carrot top tabouli it is. I usually add chickpeas, this time I didn’t. It’s just a classic, simple recipe. 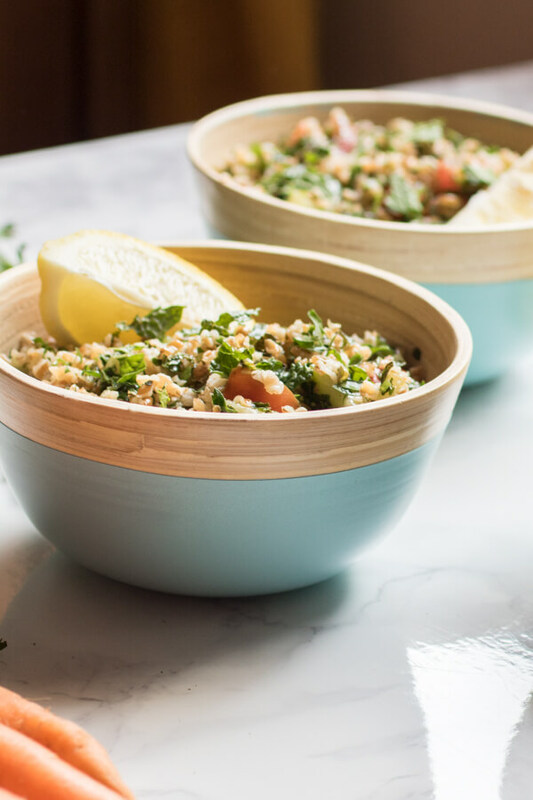 Tabouli highlights the best ingredients of the season, makes kids dance, and makes moms happy. I mean, does it get better than that? In a large bowl combine bulgur wheat with boiling water, 1 tbsp lemon juice, salt, and 1 tbsp olive oil. Cover and allow to rest for 30-60 minutes or until bulgur absorbs all liquid. Combine remaining ingredients with bulgur, toss well. Will keep in fridge for 5 days.